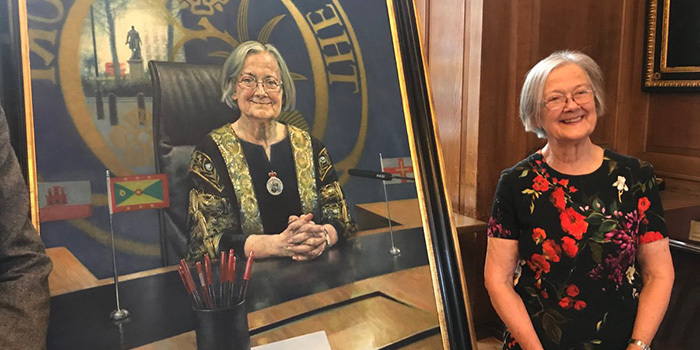 A new portrait of Supreme Court president Lady Hale has been unveiled at Gray’s Inn — and it’s causing a stir on social media. The painting, produced by critically-acclaimed artist David Cobley, depicts Hale in judicial robes and sitting at one of the Supreme Court’s benches. Unveiled by Hale yesterday evening, the special artwork was commissioned by Gray’s Inn — where she was called to the bar in 1969 — and will hang in the Inn’s historic hall, alongside portraits of renowned law lord, Lord Bingham, and former Lord Chief Justice, Lord Thomas. There are, however, a few unusual aspects to Hale’s new portrait. According to legal affairs journalist Joshua Rozenberg, who was in attendance at the unveiling, Hale’s painting “will be the only portrait in the hall to show the sitter smiling”. Other social media users found it somewhat unusual that the painting portrayed Hale sat in front of a bunch of red pens. The hands are especially fine but the collection of red pens give me the shivers. What’s with all the red pens?! Yorkshire-born Hale read law at Girton College, Cambridge, before becoming an assistant lecturer at the University of Manchester. Working part-time as a barrister, Hale spent almost 20 years in academia. The 73-year-old, known in law student circles as the ‘Beyoncé of the legal profession’, was elevated to the role of Supreme Court president last summer. She is the only woman to hold the position. Tom, I hope you know that somewhere KK is currently cursing you with jealousy. There isn’t a single “law student circle” who is referring to her as Beyoncé. Unless you count the failed ones at Legal Cheek HQ. Hmmm. Wondering how many law student circles you’re in contact with, versus how many Legal Cheek might be in contact with? She isn’t the “Beyonce” of Law. Nobody cares. Well, Arden LJ had always been tipped for promotion ever since the early 2000s, and while she’s arguably a good judge, they didn’t ‘tap her shoulder’ over Lord Walker, or Lady Hale or Lord Mance, or Lord Neuberger, or Lord Clarke. So maybe she wasn’t that good for those deciding the promotions at the time, and the same could be said about Hale, but both have admittedly developed into excellent judges. And realistically, after her husband’s elevation, her promotion would have been a logistical nightmare for listing officials given that both she and Mance share similar expertise, irrespective of the fact that the court never sits en banc. I’ve never had it clearly explained to me why a husband and wife can’t sit on the same court in the same hearing… I can understand why e.g. a an advocate can’t appear in front of a judge who is his spouse/civil partner, on perception of bias issues, but surely that wouldn’t apply to spouses sitting on the same bench? Because often a judgment comes down to which of two or more judicial opinions the rest of the bench agrees with. A judgment by “Lady Arden, Lord Mance agreeing” would raise the perception of bias, and perception of bias is enough – justice has to be done and seen to be done. If anyone was wondering, the flags (L to R) are Gibraltar, Grenada and Guernsey. She was the only one to dissent when the Judicial Committee of the Privy Council most recently refused to commute two Caribbean death sentences in 2015, y’know! Lady Hale is not “sitting at one of the Supreme Court’s benches”, she is plainly and obviously sitting at one of the Judicial Committee of the Privy Council’s benches. Basic. Good morning Joshua, came the email. Do you mind pasting the text below into your Twitter feed. I think there should be a portrait of the registrar. Switching the LCJ for Leveson on tommy robinson and getting a 4 to 3 vote for the status quo on Northern Ireland abortion was bureaucracy at its finest. Why so ‘re Leveson ? Because Leveson already has a public profile and, with the tendency of former judges to go back into practice, he could have been his own man. The LCJ less so because he has taken the purplest ermine from the gifts laid out on the table. A person of second rate intellect – hence her focus on family “law” – who got to the top position purely by dint of positive discrimination. Her judgments frequently display sloppy thinking, as exemplified by her judgment in the recent Owens case, which was calmly eviscerated by Lord Mance. What are you on about? Lord Mance’s brief judgment refers to the trial judge’s reasoning. He disagrees with the interpretation of this preferred by Lady Hale AND Lord Wilson (with whom the other justices agreed). Did he eviscerate Lord Wilson as well? Gloster (Cambridge, top London commercial practice at One Essex Court) should have gone to the SC instead of Black (Durham, family hack in Leeds). That she could only have served 2 years was the reason, but that was absurd, given that Collins was only there for 2 years and made an outstanding contribution. She looks like she is going to mark a student’s finals.